The year 2015 marks twenty-eight years since the publication of Tygodnik Powszechny magazine’s interview in which Andrzej Wajda announced his intention to create a Museum of Japanese Art and Technology in Kraków – a permanent venue for exhibiting Feliks ‘Manggha’ Jasieński’s collection of Japanese art. In 1994, during the opening of the new building, nobody would have thought that the new facility would initiate a whole series of the artist’s ideas instigating the creation of new architecture in Krakow, along with new cultural and educational institutions. 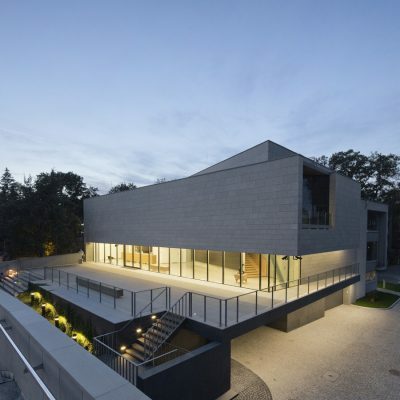 Following that project, which was unprecedented in every possible way, more were launched on Wajda’s inspiration: the Tea Pavilion with a garden, the Japanese Language School, the Wyspiański 2000 Pavilion, and now the most recent development – an exhibition annex to the Manggha Museum called Europe–Far East Gallery. The main building of the Manggha Museum is a complete, finished composition, with a sophisticated and unique roof form, characterized by a juxtaposition of several planes based geometrically on the hyperbolic paraboloid. Any action seeking to complement or extend this composition would involve the danger of interrupting its unquestionable harmony. New design efforts in the proximity of the main building should, in my opinion, respect and highlight its uniqueness and create merely a reasonably neutral architectural background that complements and orders the surroundings. Thus the Manggha Museum building remains the dominant element in formal and functional terms, and it is to it that the scale and composition of the new building are subordinated. Its shell has therefore been removed as far as possible from the approach to the Manggha’s main entrance and situated so as to prevent it from blocking the view of the existing building from ul. Konopnickiej. The height has been aligned to the scale of the undulating roof of the Manggha. 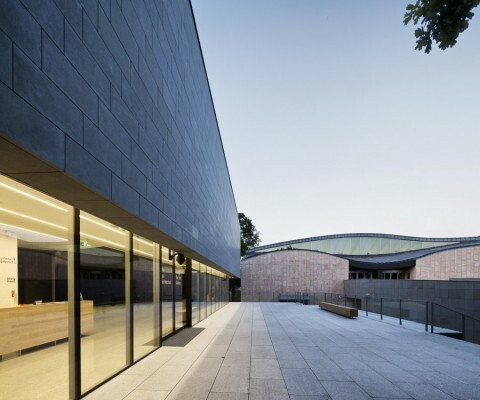 A separate entrance zone has been designed for the Gallery, with its own stairs, a disabled ramp, and a terrace which can be used for exhibition and artistic activities outside the building. The situation of the terrace augments the public space in front of the Manggha and creates an additional urban interior, delimited by the façades of the two buildings. The space under the terrace accommodates an indoor car park. The parapet line of the first floor is a continuation of the edge of the Manggha Museum’s northern wall, and the height of the roof – the parapet of the upper storey – is below the level of the upper part of the skylights in the Museum building. Made up of simple glass and sandstone surfaces, the façades are composed in correspondence with the analogous forms of the existing outdoor architectural elements in front of the Manggha – the ramps and the stairs. 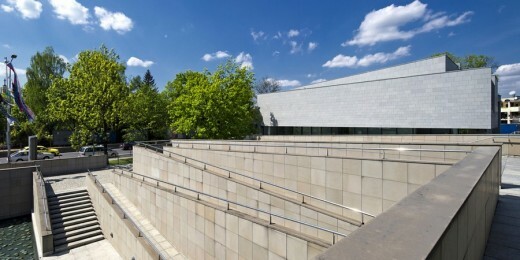 The diagonal upper part of the south elevation corresponds to the diagonal lines of the balustrades on the ramps in front of the Museum building. Calm, simple and reserved in expression, the architectural form of the new structure provides a discreet background for the main building, thus foregrounding its characteristic architectural expression. Along ul. Konopnickiej, the proposed side line of the building corresponds to the direction set by the curb and pavement, initiating a new alignment of the frontage along the street towards the Dębnicki Bridge. To the north and east, the building is flanked by, and constitutes an architectural continuation of, the Japanese Language School, erected by the Kyoto–Krakow Foundation in 2004. The height of the parapet of the School building is continued by the line of the cornice on the adjacent fragment of the proposed Gallery’s façade. The finish materials specified for the façades are in tune with the character and colour schemes of the neighbouring buildings. The main material used in the upper parts of the elevations is the Italian Pietra Serena sandstone, while the lower sections are finished in black granite. The grey front façade corresponds to the colour of the Manggha’s roof, clad with titanium zinc sheet, and of the elevations of the Japanese Language School. The neutral and synthetic form of this elevation has been attained by eliminating window openings from the front wall. All the windows of the office part on the second storey are grouped on the western elevation, overlooking ul. Konopnickiej, and on the east side, which opens a view of the garden and Wawel Hill. 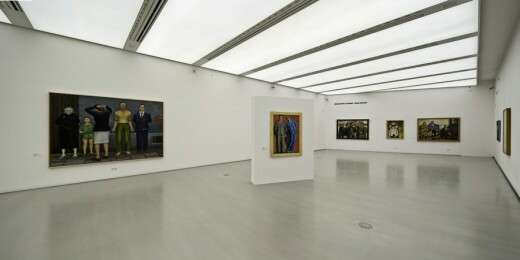 Exhibition function: This is the primary function of the building; the exhibition spaces include two large rooms located on the first and second floors, similar in size – about 264 square metres each. They are regular in shape, and maximum height obtainable at this location – between 3.85 and 4.25 metres – which allows for the flexible display of various forms of traditional and modern art, multimedia installations, etc. The storage spaces supporting the exhibition function are situated underground and on the ground floor, the latter also accommodating a storage area for deliveries. Furthermore, the basements house a workshop and exhibition preparation space, as well as technical rooms. Foyer: Such functions as entrance, foyer, information and cloakrooms are located on the first floor, which is the main storey of the building. 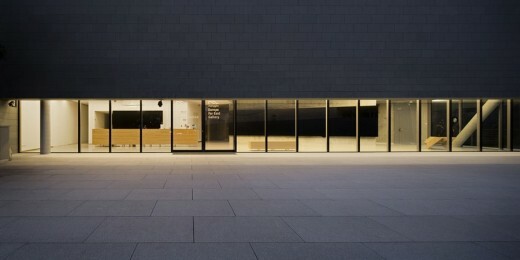 The foyer is extended visually and functionally by the external terrace. The first floor near the main entrance is also the location of an auxiliary room for supervision and control systems, communicated with the guards’ room in the main building. Visitor toilets are situated on the ground floor, accessed via separate stairs from the foyer. Administration and office functions, complete with a small conference room and employee rooms, are located on the second floor. Technical functions: The rooms housing ventilation and air-conditioning machinery, heated-water connections, electrical switchboard, water pumps and a hydrophore system are all located in the basement. Parking: An indoor garage at the ground level provides twenty-two parking spaces, of which eight are traditional and the other fifteen based on a two-level mechanical system. The parking garage is accessed from ul. Sandomierska. The Gallery building has three storeys above the ground and one underground level, used for a wide variety of functions. The structural layout of the components making up the proposed facility is complex and heterogeneous. This has been caused by the location and the complex geometry of the site, but also by the multifunctional nature of the facility and the immediate proximity of existing buildings. The main structural elements are reinforced concrete slabs, plates and columns. At the basement level, the supporting structure is provided by a closed system of outer reinforced concrete walls, 25 centimetres thick, and inner walls of varying thickness, between 20 and 25 centimetres. The layout of the basement walls together with the foundation slab and the ‘zero’ deck form a rigid box transferring the load to the ground, as well as conveying the stress from the outer walls. The outer walls and the foundation slab constitute a watertight basin, made of water-resistant concrete. The supporting structure of the first storey (ground floor) comprises the outer walls, 25 centimetres thick, and inner walls of varying thickness, between 20 and 25 centimetres. The structure of the second storey is formed by the 25-centimetre slab and the outer walls, each 25 centimetres thick, and the protruding front wall, also 25 centimetres thick. The latter wall, which is not continued downwards, is attached along its height to cantilever plates, which are extensions of the side walls. This structural system – plates, slabs and columns – has the spatial rigidity required to convey all the stresses and distribute the loads evenly when transferring them to the ground. Portico Project Management sp. z o.o. i Wspólnicy sp.k.